This high-specification compact fanless PC comes fully-built and ready to go. It has no fans for zero noise, zero dust and zero maintenance. It can be used as a general purpose machine or a dedicated media PC. The Sentinel Fanless PC offers great performance, low power consumption and absolutely silent running. Only 110mm high and 250mm wide, it is functional, attractive and unobtrusive. The machine is supplied in a shot-blasted finish and its fascia is clean, elegant and uncluttered. Because we use a fully-featured motherboard, the PC is a very capable unit. It can be built with up to 32 Gigabytes of memory and one of AMD processors that feature Radeon Vega Graphics. So when paired with the ASUS X470-I motherboard, expect excellent visuals even at 4K resolution, thanks to the onboard HDMI 2.0b port. Despite its diminutive size, it packs a real punch - AMD latest processors give fantastic performance and low power consumption, allowing the machine to be cooled without any forced air whatsoever. The whole case acts as a processor heatsink, with heat being efficiently transferred from the CPU to the chassis via four copper heatpipes. Photo showing internal component layout - internal optical tray has been removed to give a better view. Motherboard RGB lights can be turned off. Streacom FC8OD ALPHA Black Fanless Aluminium ITX Chassis ? Streacom FC8OD ALPHA Silver Fanless Aluminium ITX Chassis ? 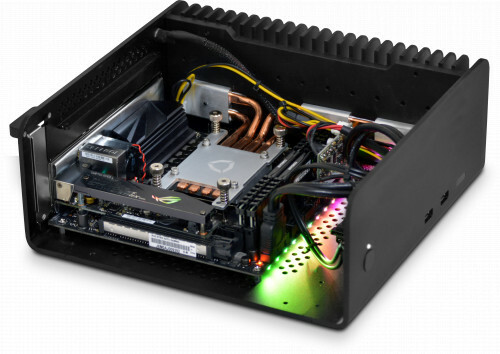 Streacom FC8WS ALPHA Black Fanless Aluminium ITX Chassis, no optical ? ASUS ROG STRIX X470-I Gaming AM4 Mini-ITX Motherboard ? 3.2GHz AMD Athlon 200GE 35W 2C/4T APU with Radeon Vega 3 Graphics ? 3.5GHz AMD Ryzen 3 2200G 65W 4C/4T AM4 APU with Radeon Vega 8 Graphics ? 3.6GHz AMD Ryzen 5 2400G 65W 4C/8T AM4 APU with Radeon Vega 11 Graphics ? 3.2GHz AMD Ryzen 5 2400GE 35W 4C/8T AM4 APU with Radeon Vega 11 Graphics ? 4GB Corsair DDR4 Vengeance LPX 4GB (1x4GB) Memory Kit ? Streacom ST-AM4 CPU Mount ? Arctic Silver Ceramique 2 25g, Tri-Linear Ceramic Thermal Compound ? Arctic Silver AS5 12g, High-Density Polysynthetic Silver Thermal Compound ? Noctua NT-H2 Pro-Grade Thermal Paste, 10g ? Streacom ST-NANO120 120W nanoPSU (one SSD and optical drive only) ? Streacom ST-NANO160 160W nanoPSU ? IEC C13 Euro Mains Power Cord, 2m (120/160W PSU only) ? IEC C13 UK Mains Power Cord, 1.8m (120/160W PSU only) ? Streacom ST-OB2 Slot-Load Blu-ray Reader Optical Drive ? StarTech Serial Port Low Profile PCI Bracket for 10-pin COM Port ? StarTech Dual-port eSATA External 6Gbps PCI Express Card ? LyCOM PE-107 Dual 800 and Single 400 Firewire Card ?